That's right mga Ka-Tropa. 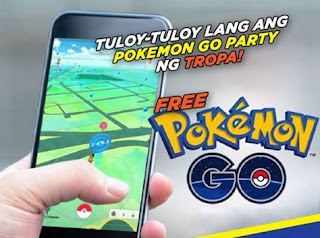 Wag muna mag pa load para makapag laro ng Pokemon Go using your mobile data or better yet your Pocket WIFI kung ang purpose mo lang naman eh mag laro ng Pokemon Go. Outside the app TNT will charge for the basic data services so be sure to activate load protect when playing Pokemon Go gamit ang TNT SIM nyo. There is no need for registration, just download the app on GooglePlay for Android and Apple Store for iOS. Note: Data needed in downloading the app is free. Cost: P0.00 pesos as in ZERO! If possible use Pocket WIFI, this will increase your battery life and more stable data while playing. Catch every Pidgey, Rattata, Weddle, etc. have enough candy for 30 evolutions and use lucky egg while evolving them altogether. This trick will give you 1000 experience points each. Just do the math.